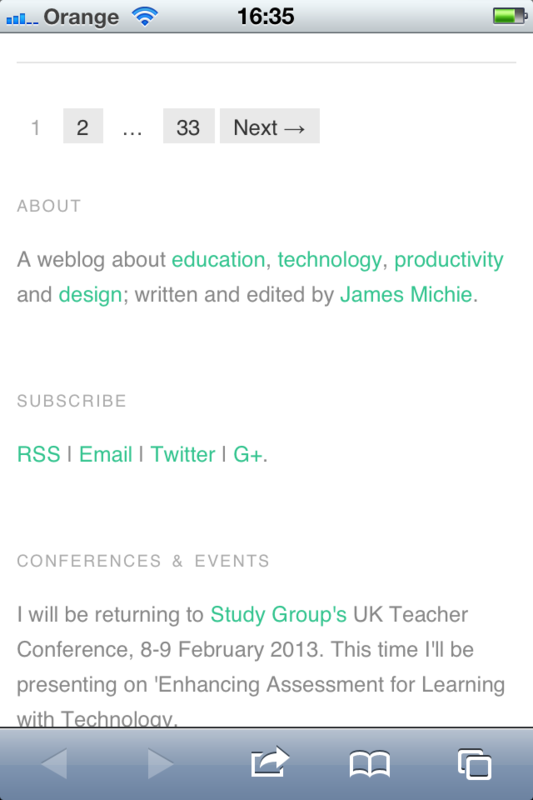 I edited the sidebar CSS to make the font size and colour more consistent with the blog body. As well as videos and images, embedded Google Docs now resize automatically. 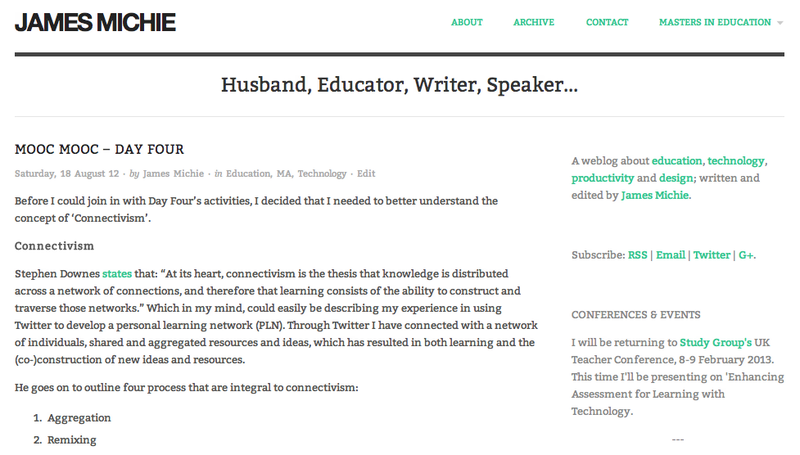 I achieved this by editing the FitVids.js script within my blog’s theme. While it doesn’t specify this on the FitVids.js github page, it will work with both ‘docs.google.com’ and ‘drive.google.com’ documents embedded using the iframe tag. 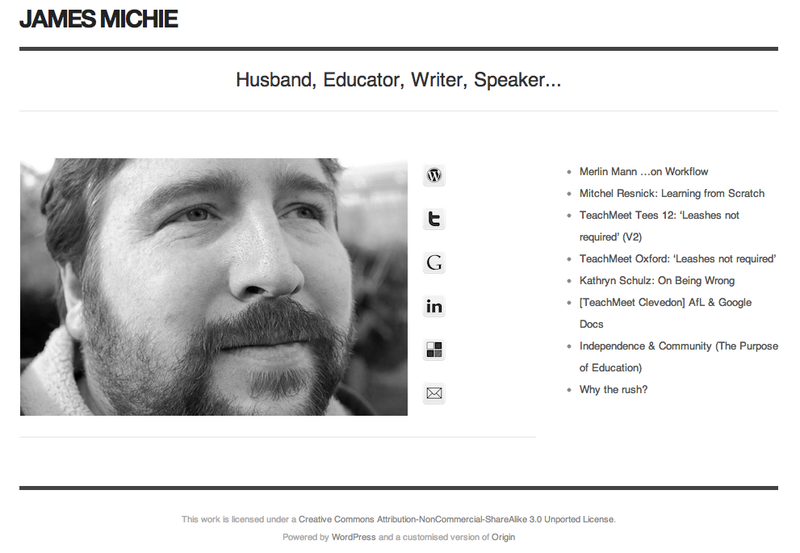 My home page now features a mini-profile with links to specific content, rather than a series of buttons. I think that it is more personal and does a better job of providing an overview of who I am, what I do, and where I can be found online. 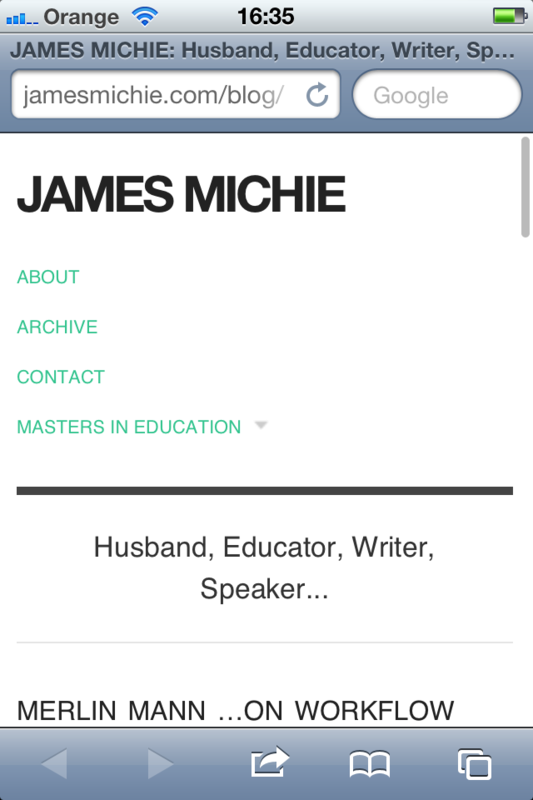 I have also employed the built in menu to display direct links to key aspects of my online footprint, including my Twitter and Google+ profiles. These changes have also improved the way the home page displays across all devices. The mobile web is in the ascendency, with many UI and UX designers, iterating for mobile before desktop. With this in mind I have been wrestling with CSS and HTML5 to make my blog more responsive to different screen sizes. However, I kept encountering a range of problems, trying to turn a basic WP theme into something far more up-to-date. Instead I have installed the Origin theme, which is already set up to be responsive. 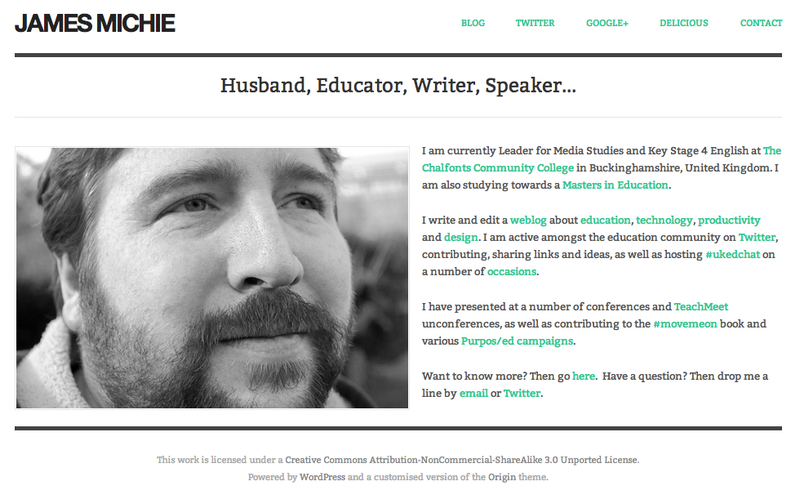 Tinkering around with both the CSS and HTML, I have managed to construct a design that I am happy with. I coded a menu at the top and took the opportunity to install a new contact page. I also removed some features that I felt were peripheral, adding to the minimalistic style I favour. 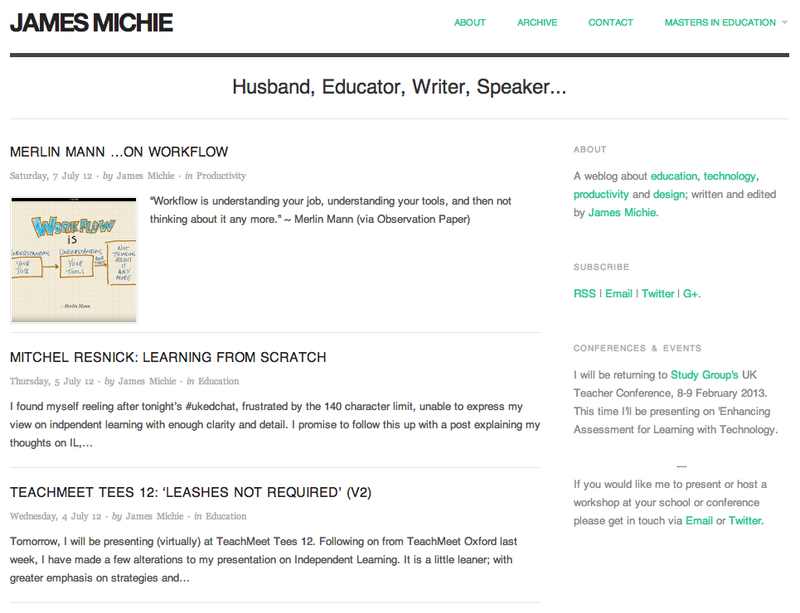 Sporting the same theme as my blog, my home page is also more minimal, creating a more consistent experience for people who stumble across via search or through links on Twitter and Google+. 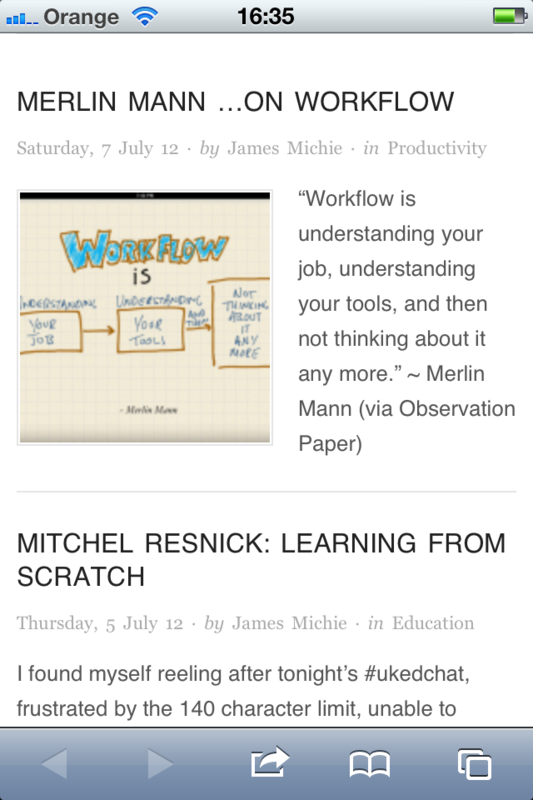 I am most pleased with the way my blog now renders on mobile devices. The menu drops below the header, while the text resizes naturally to fit. The sidebar becomes pinned to the bottom of the page below the posts, and the posts themselves maintain all of their formatting. Images and videos also adapt to suit whichever screen they are being viewed on. Moreover, the blog is HTML5 compliant ensuring that all content is viewable regardless of OS or browser. Please let me know what you think, particularly if you are viewing this on your mobile device. I’m interested to learn from others’ experiences; aiming to make my blog as accessible and user friendly as possible. [#ukedchat] Starting with a blank piece of paper: Design the school of your dreams. Next Thursday, I will be hosting #ukedchat for the third time. Are schools (as physical spaces) necessary to facilitate learning in the 21st century? The resulting discussion was a thoroughly engaging one, which raised more questions than provided answers. It was apparent that most of the educators who got involved, felt that schools as physical spaces still have purpose. However, it was also clear that schools in their current state are not 100% fit for purpose. Be it the learning space itself, the infrastructure or the curriculum, a number of areas for improvement were recognised. Starting with a blank piece of paper: Design the school of your dreams. What should be learned? How should it be learned? How should learning be structured? Subjects? Skills? Should learning be assessed? If so, how? Is there a place for grades? How can we accredit informal learning? AfL? Badges? Who is to be involved? How will they be involved? Teachers? Students? Parents? Where will the learning happen? Classrooms? What role for libraries? What about virtual spaces? How long should the school day be? Should it be the same for everyone? How would lessons/timetable be structured? What technologies should be utilised? Wifi? Tablets? BYOD? And so, if that has suitably whetted your appetite, I hope that you will be able to join me on Thursday at 8pm. [Update: Saturday, 21 April] This was the 94th instalment of #ukedchat. You can read a summary of the discussion here and read/download a PDF archive of all the tweets here. Posted on Thursday, 12 April 2012 Sunday, 4 May 2014 Categories EducationTags #ukedchat, assessment, curriculum, design, discussion, dream, education, ken robinson, people, provocation, school, space, Technology, time, twitter3 Comments on [#ukedchat] Starting with a blank piece of paper: Design the school of your dreams. Since my previous post I have added a few more apps and settled on an arrangement for my home screen. 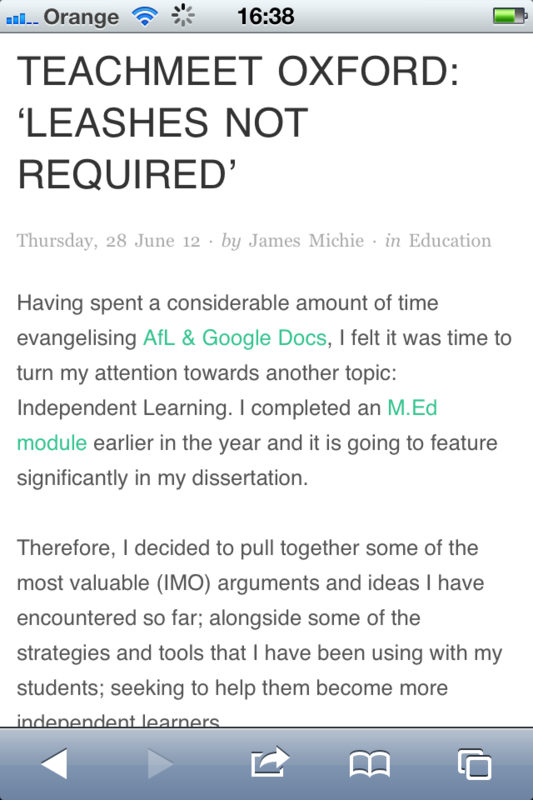 Evernote – I have been using Evernote to manage and organise my M.Ed studies. It is an invaluable tool. I use the desktop app almost every day and have been making regular use of the Android version. On first look, as I have found with other cross platform apps, both the iPhone’s UI and UX are vastly superior. What’s more the quality of the display on the 4S is crystal clear. 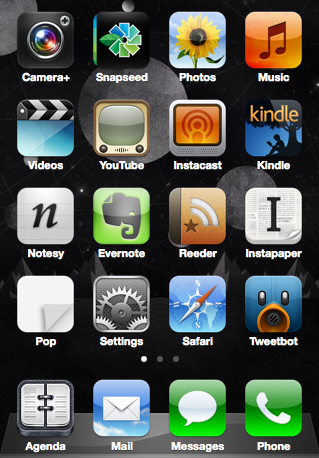 Instacast – Like Tweetbot, this is an app I have wanted to use for some time. It has been well reviewed, with the consensus being that there is no better app for the job. As an avid listener to podcasts, I am very pleased with my experience so far. What this app offers over the built in music app is the ability to stream shows, download on the fly and access show notes within the app itself. This makes for a far richer listening experience. Agenda – The built in iPhone calendar has a very poor UI. Agenda, is clean and minimal, utilising sound principals of typographic design. Pop – I’m a huge believer in ubiquitous capture and even with Notesy installed, sometimes all you need is a piece of paper. That is exactly what Pop offers: a piece of paper on to which you can write stuff down and return to later. The only other options are: select, select all, copy all and paste. This adds what I would call ‘useful friction’ in that when I decide to act on the information I have captured in Pop I will have to make an effort to move each piece around. This means I will be forced to decide if what I noted down is really valuable or not. Snapseed – Nearly everyone who replied to my initial tweet recommended this app, and I have already had loads of fun playing with it. It offers a wide range of features, from basic editing features such as cropping and rotating to more stylistic effects such as manipulating depth of field. In terms of arranging the apps, my choices are based on frequency and tactility. Apps towards the bottom of the home screen are the ones that I use most often. As such I want them positioned where I can access them quickly when holding the phone in one hand. Beyond that the apps are loosely grouped: Photography, Sound & Video, Reading, Notes/Writing, Interruptions. TweetBot – This was the first app I downloaded and installed. Partly because Twitter is number one reason I use a smartphone but mainly due to the fact that I have been coveting this app since it was first released. As an Android user, I have had to read/listen to others talk about how good it is, while being stuck with only mediocre choices. And, my first impression is a significantly positive one. Both the UI and UX are superb. The only feature it lacks is ‘keyword block’ which I enjoy with Hibari on Mac. Instapaper – This is another favourite, regularly used app that has been poorly served on Android. Marco has done a wonderful job with version 4.1.1; the attention to detail is meticulous. I can already tell that I will be opting to catch up with my unread items on my iPhone rather than on my MacBook Air. Reeder – I have been using the Mac-based equivalent since I bought my MacBook Air last year. The iOS version does not disappoint, attractive UI and friction free UX. Kindle – Most of the time I read on a Kindle Keyboard but I tend to use my phone when I am travelling to and from work. The iOS app is identical to the Android version and was a natural choice for inclusion at this early stage. Notesy – This was the most difficult choice. I considered Byword, Writing Kit and Plain Text before deciding to try Notesy. Plain Text does not include Markdown support, making it easy to remove that from the selection process. Writing Kit was a little too feature rich and I was concerned that it would not fit into the minimal mindset that I have with regard to text editors. Based on some thorough reading and a helpful chart, I settled on Notesy due to the fact that I could customise the UI more than in Byword. I’ll follow this up as I continue to add apps and use the phone.